North explains what the passage means by "the money has failed." It had become worthless due to government inflation. The social effects were profound. North marches through the history of Egypt to fill in the gaps. The Pharaoh was rich, and the people of Egypt survived, but at very high cost: the loss of their freedom. They sold themselves into a form of slavery in order to buy food, for they sold their land and their children’s inheritance to Pharaoh (Genesis 47:19–23). That’s poverty with a vengeance. But they survived the famine. They bought their lives. As part of the exposition, North provides a tutorial on the Austrian theory of money's origins, functions, and workings in society. He explains this well-known passage: "Your silver has become dross, your wine mixed with water. (Isaiah 1:22)"
And also this one: "Diverse weights are an abomination to the Lord, and a false balance is not good. 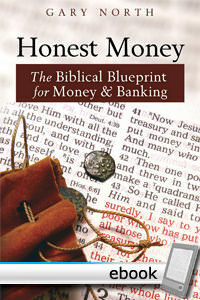 (Proverbs 20:23)"
He offers an entire chapter that carefully refutes the canard that the Bible forbids the charging of interest, and further explains what is meant by the condemnation of "usury." It is all written in very clear language that is designed for teaching. There are also study questions at the end of each chapter. In this way, this book would make an excellent money and banking text for a private religious school - or for anyone who is concerned about what the Bible says about this critical subject.